Many times I see President Museveni as a big joker who fails to own up for his own sins. Commonsense is not common, is true for President Museveni, otherwise how could he know, or possibly he does not know that his role and that of his party to see him victor in the 2011 Presidential Elections is what Ugandans have to pay for in form of collapsed economy. His childhood dream to be a Uganda leader is the fruit the country is reaping. During the burial of 1st NRM Commander Ahmed Seguya in 1991 in Bugerere, President Museveni is quoted to have said what he left out in his Sowing the Mustard Seed. He said that after he had completed his degree at Dar es Salaam and he had been appointed a Research Assistant in President Obote’s Office, he identified young boys; Ahmed Seguya, Abaas Kibazo, Haruna Kibuye and Zubair Bakari. He used to sneak pistols from President’s Office and trained them at Mengo Kisenyi. After Idi Amin’s coup, Mr. Museveini run away with these boys to Tanzania. He instructed them back and gave them different assignments. These used to drive him whenever he would sneak back. The story is what eventually led to the vicious circle of liberations which ended up with the 1986 liberation war. The scheming by President Museveni has continued on through his 26 years as President; this has seen him involved in various schemes in the region like the overthrow of Mobutu to mention but a few. The sum total of President Museveni’s actions including the patronage scheme, uneconomic opening of new districts, wrong economic policies, are the fruits of Museveni’s sin for which Ugandans are paying a big price, up to when, only God knows. Instead of owning up to his sins, he instead looks to the opposition as a punching bag. It is not the opposition which told him to stay in power beyond 2006, it is not the opposition that gave instructions for Basajjabalaba to be given billions of tax payer money in dubious compensation, know is it the opposition that has bought fighter planes that have left the treasury empty. Museveni has to grow and cease to act as if he were a child when the destiny of many millions of lives and future of Ugandans is in his hands. In what his critics have called “sheer escapism,” President Museveni has attacked the opposition, the media and environmentalists, saying they are responsible for the current economic crisis. The President who was addressing the NRM Caucus retreat in Kyankwanzi on Friday also blamed escalation of the crisis on corrupt public officials who embezzle public funds from the private sector and the NRM majority who sit silently in Parliament and allow those he called “traitors” to sabotage the future of the country. “Fake and shallow environmentalists, on the other hand, as well as sectarianism and sabotage, orchestrated by the (Livingstone) Okello Okello group with impunity, were responsible for the shortfall in sugar production as compared to demand for sugar,” he said. “Also responsible are the press that amplify these falsehoods”. The President said the economy is robust and growing very fast, adding that the mistakes made by elements of some politicians were responsible for his government’s failure to developed electricity and the economy. The NRM leader has on several occasions lashed out at the opposition, the media and the West for the current financial crisis, a tactic that many analysts and opposition leaders say is meant to deflect criticism from the President’s mismanagement of the country’s economy. “President Museveni is trying to divert Ugandans from the real issues. He is trying to conceal his incompetence by blaming everybody including his own party. Ugandans are suffering and he is busy passing the blame instead of proposing economic reforms to help the people,” Leader of Opposition in Parliament Nandala Mafabi said. 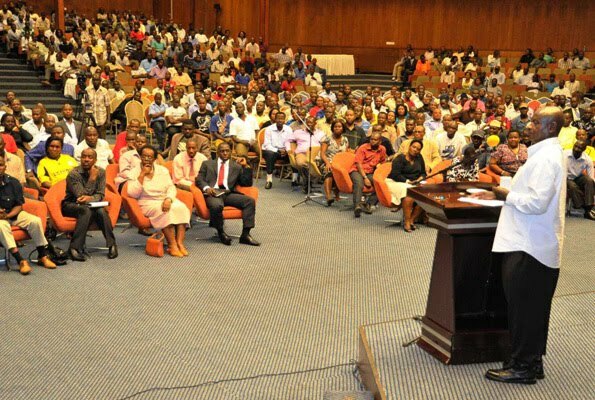 The President’s statements, come at a time when a number of Cabinet ministers are facing corruption accusations has also got him in trouble from Ugandans who believe he has spent too much time slamming the West and the opposition. WILL MAKERERE VC; BARYAMUREEBA SURVIVE THE PROBE? WAS MUSEVENI'S WAR CALLED FOR?